Jeco Wood Look Birdhouse with Wind Spinner, Brown. Dimensions: 16.9L x 12.2W x 48.4H in. Low-maintenance polyresin and fiberglass construction. For both indoor and outdoor use. Bring soothing sounds and gentle movement to your indoor or outdoor living areas with the enchanting Jeco Wood Look Birdhouse with Wind Spinner. Featuring a wood-inspired design that includes a birdhouse, a water wheel, and a wind spinner, this fountain makes a charming accent to your table, shelf, patio, or garden. Dimensions: 16.9L x 12.2W x 48.4H in.. 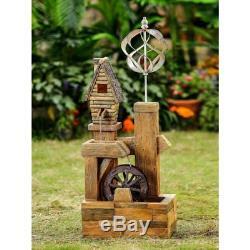 Features rustic birdhouse and wind spinner. This listing is currently undergoing maintenance, we apologise for any inconvenience caused. The item "Jeco Wood Look Birdhouse with Wind Spinner, Brown" is in sale since Friday, January 19, 2018. This item is in the category "Home & Garden\Yard, Garden & Outdoor Living\Ponds & Water Features\Outdoor Fountains". The seller is "hayneedle" and is located in Middletown, Ohio.